For some years Otto Lilienthal of Germany had been interested in flight by man. He attempted to unlock the secrets of the birds by studying the wings of the Albatross. 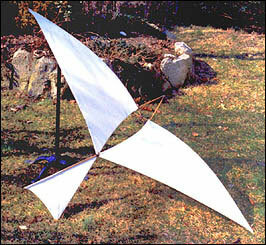 Inspired by the bird's wing, he developed this machine in 1874 - the first kite with a wing shape (airfoil) in order to gain lift. It was his success with this kite that led to his decision to build man-carrying gliders.